We sell Floradix - Salus products like Floradix (Salus) Organic Pure Sage Tea - 15 bags online in the UK and directly from our award-winning store in Scotland. Organic Pure Sage Tea, sage herb and nothing else. Floradix (Salus Haus) has a wide range of organic, pure herbal teas. We sell real Floradix - Salus and other Herbal Teas directly from our shop in Scotland and online throughout the UK. View more products from Floradix - Salus. Where can you buy real Floradix Sage Tea safely online? If you are wondering where you can buy Floradix (Salus) Organic Pure Sage Tea - 15 bags safely online in the UK, then shop with us. 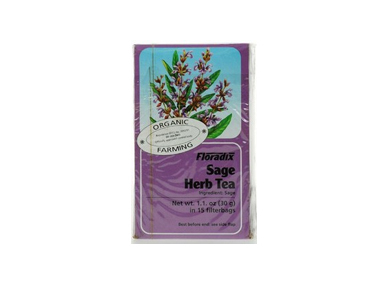 Floradix Sage Tea - Floradix (Salus) Organic Pure Sage Tea - 15 bags in Herbal Teas and Tea Loose & Bags.